I don’t try to hide it – I believe that we’re in a transitional period to fully open access (OA)* scholarly journal publishing, at least in the sciences. And while I could see this playing out in different ways that have varying impact on equity, concentration of wealth, quality of scientific publishing, etc., by and large I do believe this transition is a step forward for equity and knowledge, through increasing access to information (one of the core values of librarianship). I’ve been involved with various OA interest group/committee/task forces, as well as policy development and empirical research projects related to advancing the state of OA. I’ve given educational talks, webinars, oral & poster conference presentations, and published articles on various aspects of OA. Yet, I have come to recognize that some very important “advocacy” work on the OA file may not be writing letters to politicians or giving formal talks, but the informal talks I have with editors in venues such as non-LIS conferences. In other words, sometimes I think that my potential for advancing OA as a member of the research-author community is just as great as that in my role as a librarian, OA advocate and researcher. I was reminded of this during a recent conference session, when I had the opportunity to talk with a couple of editor-types (journal editors or journal editorial/advisory board members) as they stopped to encourage me to consider submitting work to their journal. Research conferences are natural opportunities for editor-types to publicize their journals and recruit authors/articles of interest. Poster sessions are a natural ground for not-yet-published research that may soon be looking for a home in manuscript form. Therefore, as a poster presenter at a large research conference, one can expect to talk with editors. In OA advocacy, I think we tend to focus a lot on the author-publisher dynamic in terms of negotiating copyright and advocating for journal policy change. This makes sense on the individual-article level, and to some extent with the advocating for policy-change level. But editors may be quite important for effecting journal level change to OA, and communicating to publishers through another route. Journal editors are often in a crossover position, both researchers in their own right and in a close working relationship with the publishing company managing their journal. ** In scholarly communities, editors are often one of “us” – researchers – rather than one of “them” – publishing industry folk. As a researcher’s career advances, it’s often expected that s/he will take on academic community service such as journal editing. And as researchers, they’re still going to conferences in their given field, so journal editor duties, such as scouting out potential articles, dovetail well with their own scholarly interests. So, when I’m there by my poster and an editor hands me her/his card*** and suggests I consider a particular journal for publishing, I ask if it’s open access. If they say no (generally meaning not Gold OA), I ask if authors are allowed to archive a copy in a repository such as PubMed Central. Most (but not all) say Yes to that now. I let them know about the many funder mandates under which my research group is obligated, and also that it’s important to me ethically and career-wise as an early-career researcher to make my work accessible to the widest audience possible. If I’ve already published the research I’m presenting, I make a point of clearly mentioning that it’s available open access online, so anyone can read it without a subscription. And then we talk about their journal’s new policy matters column, or the scope of their journal, or a question they have about my poster, or whatever else. I don’t sit on the OA point forever, but I do ask it, and generally first thing, when an editor suggests their journal. I think this makes a difference. Does this make a difference? It’s possible that I’m deluding myself and seeing impact where I want to. I can’t quantify a difference this type of questioning makes, but I have had one or two instances where editors have come back to me in another year or emailed with me much later to let me know that they have moved to OA or checked and will comply with Canadian funder policies (which are generally shorter embargo period than US/UK funder policies). So I think it helps. And I sincerely encourage other research folk who are also concerned with OA to adopt this strategy when talking with editors. I’ve talked with publishers at LIS conferences, and it’s not the same thing at all. By now, they expect some OA flak from us pesky librarians. These days, staff from the major publishers are either prepped with the official OA line or else have to defer to the higher powers in decisions about things like OA – their job at the conference is mainly to “build relationships” with potential customers and ultimately to sell product/subscriptions. Now, different people have access to different advocacy and policy-making opportunities, and some people I know are senior enough in their fields to, say, be at the table when a major research funder is developing their research policies. This type of access is a major opportunity – and having funder policies in place gives me a much stronger position from which to ask journals to go OA. That said, it’s not my opportunity at this point in my life. And the people at those tables probably don’t need my tips on OA advocacy anyway. But to all those of us who are more junior or just not in those circles, we can influence policy in our own way. Some of it is “loud” and public – professional or scholarly association letters to research funders in favour of OA policies, for example. But I’ve come to think that a significant portion of that is kind of quiet, too. So next time you’re presenting research at a conference, I encourage you to mention OA as a priority (not THE priority – we all know there are many) in your publishing decisions. It matters to editors. They want your submissions. *Open Access here fairly broadly applied to mean scholarly publications that are free to read online. **While I recognize that several scholarly journals are published independently, by a scholarly society, or through a “publisher” such as a library that hosts OJS, in my health publishing experience the dominant model in this field is increasingly to be independently edited but managed by a larger publishing company, although the scale of the publishers does vary widely. In an only somewhat-overdue update (thanks to conference season interrupting my regular blogging activities – I do write on the road, but need to get sleep & give a read over before I can push “publish” on a post) the Canadian Instutites of Health Research (kind of the Canadian NIH, for US American readers) has put out a new message regarding the missing CIHR trials policy that we’ve been following since late March. Then, right around June 15 or so (I saw it on the 17th), CIHR President Dr. Alain Beaudet issued a “Message from the President – Policy on ethical conduct of research involving humans.” Go read it: http://www.cihr-irsc.gc.ca/e/43756.html. If you’re anything like me, you may need to read it a few times over, because it’s not the clearest statement ever made. CIHR will (at some unspecified point) be integrating certain of these more stringent operational requirements as part of the terms and conditions of its “relevant programs.” These include: a) publication of the systematic review used to justify the trial, b) registration and compliance with WHO requirements for minimum data disclosure, and c) submission of final reports in CONSORT format. CIHR will propose 4 revisions to the TCPS-2 for “prompt consideration” (not clear on how soon this can/will happen): a) applying to all trials, not just clinical trials, b) requirement to update trial registration when the trial protocol changes, c) requiring that serious adverse events be reported in post-trial publications, and d) and a requirement to deposit aggregate data in an unbiased, publicly accessible database. In the interim, CIHR will specify that researchers have to “comply with all the requirements mentioned above” (not sure whether this means 4a-c or is also inclusive of 5a-d). So, what does this mean? Are we all good now? Well, we’re better than we were before the press coverage, I think. We’re not as better as we would have been, had the trials policy never been pulled. Really??? I’m still kind of skeptical that 3 months after the trials policy and the TCPS-2 came out, both of which had been in development for a looong time, someone suddenly just went, “Oh, gosh, you know what? It’s not okay to have both of these policy statements!” Why am I skeptical? Well, because it just doesn’t make sense. CIHR had a trials policy that wasn’t 100% the same as the TCPS-1. Tri-council funders have all sorts of different policies that are more stringent than the TCPS, and it’s not a problem (e.g., the beloved CIHR Access to Research Outputs policy). It’s just not adding up, and at this point the message seems to be that it doesn’t matter if it’s not adding up, CIHR is sticking to their story. When will the CIHR be implementing these new requirements for relevant grant programs, and how will this implementation be different from the trial policy rules? What’s the process for revisions to the TCPS, and how long does it take? When are we going to see the requirement to make individual-level/micro/”raw” data publicly available? The item listed above in 5d, which currently has no teeth, only requires aggregate data deposit. What does this mean? How aggregate? Does this have to include all adverse events? We need to be able to reanalyse this data to look for harms to specific groups. This is one of the most important parts of the scrapped trials policy, and there is no mention of it in the new statement from CIHR. I think the international attention and public pressure on CIHR over the withdrawal of the new trials policy likely contributed to these developments, which seem like a step back in the right direction. However, without teeth in the current requirements, and a return of the publicly-accessibly micro-level data archivng requirement, it seems like 3 steps forward, 2 steps back at this point. Cached copy of the policy text here. Follow up posts here, here, and here. Thanks to a few days’ time and some help from people with more experience reading science policy, I now feel that I can expand on my previous post about the TCPS-2 “superseding” the Dec 2010 CIHR trials policy. First of all, I note that I am putting “supersede” in quotes not merely because it is a really cool word to which I wish to draw attention (although it is) but because the TCPS-2 was officially launched before (not, as I had previously thought, simultaneously with) the new Trials Policy, and as such, would not likely have been intended as a replacement for another policy that had not yet been unveiled. Unlike the TCPS-2, the CIHR policy required that the systematic review that justifies doing the trial be publicly cited. The CIHR policy required following the WHO international standards, whereas the TCPS-2 only requires that trials be registeres in registries that meet the criteria of WHO/ICMJE. Seems like a small distinction, but the difference is the minimum dataset required. This one is kind of nitpicking/pointing out an oversight, but the CIHR required the name of the trial registry as well as the registation #, whereas the TCPS-2 only asks for the # (kind of useless without the name, and presumably they want the name too, but didn’t specify). The CIHR policy took steps to prevent duplicate/multiple registration, whereas the TCPS-2 does not address this potential issue. The TCPS-2 says that “Researchers should also promptly share new information about an intervention with other researchers or clinicians administering it to participants or patients, and with the scientific community – to the extent that it may be relevant to the general public’s welfare,” which does not require public disclosure. The CIHR policy required the data to be made publicly available to all. Research design amendments (changes) require ethical approval under the TCPS-2. The CIHR policy required that amendments to the research design be reported within 30 days after the ethics approval. The TCPS-2 asks for “new risks” or “unanticipated issues that have possible health or safety consequences for participants” during the trial. CIHR policy did not ask for adverse event info until after the trial. TCPS-2 asks for info that might merit or lead to early stopping of a trial. CIHR policy wanted notification and public disclosure within 30 days of stopping a trial early. The TCPS-2 tells researchers “to make reasonable efforts to publicly disseminate the findings of clinical trials in a timely manner by publications and by the inclusion of raw data and results in appropriate databases,” whereas the CIHR policy specified reporting guidelines (e.g., CONSORT for RCTs) and required reporting and public disclosure within 12 months of the end of the trial, building on the existing CIHR research access policy. The TCPS-2 encourages researchers and institutions to publish results in a timely manner. The CIHR policy required public disclosure within 12 months and reserved the right to disclose the final report themselves within 18 months. The TCPS-2 asks for “the inclusion of raw data and results in appropriate databases” whereas the CIHR specified what appropriate databases are and that both micro (aka “raw” aka “participant level”) as well as macro (aka “aggregate” aka “summary”) level data are necessary. The TCPS-2 talks about ethics with regard to confidentiality clauses and PI access to trial data, whereas these issues were not addressed by the CIHR trials policy. CIHR was concerned with reporting and disclosing info “to CIHR and the trial registry” – and the trial registry had to be openly accessible to the public. The TCPS-2 advises on ethical matters across disciplines. It makes few specific mandates as to timeliness or data specifics. The CIHR policy was intended specifically for trials funded by CIHR, and similar to other funding policies could and did specify details of what kind of data should be reported (all, macro and micro), to whom (CIHR and a publicly accessible registry), and when (within 12 months of trial completion, or with some types of data 30 days of early stoppage of a trial). I’m not saying the TCPS-2 is bad. It’s pretty good, overall, and after years and years of collaboartive work and revision seems to do an admirable job of doing what it’s supposed to do – which is to set out general, interdisciplinary, national ethical guidelines, not details of practice requirements. Without specific procedural policies designed to instruct researchers in various disciplines, the TCPS-2’s appropriately limited scope leaves us with somewhat vague directions. I continue to be very disappointed that the CIHR has apparently seen fit to retroactively withdraw their facet of this approach, and I do think that as a public agency they do owe the public a decent explanation of what happened here. What has been made publicly available thus far does not add up. As I have stated previously, there may well be valid reasons for killing the new policy on clinical trial data, but the lack of transparency around the policy retraction continues to be troubling. According to Dr. Ian Graham, Vice-President, Knowledge Translation, the new Tri-Council Policy Statement: Ethical Conduct for Research Involving Humans (TCPS-2) supersedes the Policy on registration and results disclosure of controlled and uncontrolled trials funded by CIHR. The trials registration & disclosure policy page that was recently a 404 page is now a redirect page to the TCPS-2. I don’t understand why a policy would supersede another policy announced at the same time. Both policies were in development for years, but they didn’t notice until three months after they were simultaneously unveiled that they were redundant? Seems unlikely. It also seems odd that CIHR would send a KT Senior Advisor on a tour around the country educating people all about a new policy they would then suddenly decide was obsolete. While I have been assured that “CIHR is committed to transparency in clinical trials,” I have not gotten a clear answer as to whether or not all the exact requirements of the apparently-obsolete CIHR policy are included in the TCPS-2. (Am working on going through it with a fine-toothed comb, but it is >200 pages long and I have a head cold, so it’s slow going. ) I am particularly concerned about the preservation & disclosure of individual-level data and reporting of all adverse events in clinical trials. The TCPS-2 clearly states (Article 11.3) that “[Trial] registries, in addition to agency policies, editorial policies, ethical policy reforms, and revised national and institutional ethics policies and results disclosure requirements, contribute to a multi-faceted approach to eliminate non-disclosure.” It is concerning that CIHR apparently does not feel that the CIHR policy facet of this “multi-faceted approach” is important. If the TCPS-2 does ensure the same clinical trial reporting standards as the recently-retired-at-a-young-age CIHR policy, then this is possibly just an embarrassing right-hand-doesn’t-kn0w-what-left-hand-is-doing situation. If, on the other hand (er, that would be the third hand in the middle, I guess?) the TCPS-2 is not as specific in mandate for clinical trial registration and reporting as the CIHR policy was, this is a great loss for open access, open data and public health and safety. Making detailed clinical trial data publicly available for third-party re-analysis is the best way we have to provide safeguards on drug approval, safety & effectiveness processes – processes that CMAJ rightly criticizes as opaque and secretive. CMAJ has its own conflicts of interest, certainly, and I haven’t let them off the hook for that. But they are not the only ones. We must be vigilant not only about transparency in our scholarly publishing processes, but also about our government health agencies, including those that fund scientific research. I would hope that CIHR’s relationship with, say, pharmaceutical companies (and their former employees), would never dictate their clinical trials policies. But I want the transparency to know that is true, for sure. And I’m certainly not getting it around this question right now. If anyone has more info on this, I’m still looking for insight here, so please contact me. This is Google’s cache of http://www.cihr-irsc.gc.ca/e/42831.html. It is a snapshot of the page as it appeared on 17 Mar 2011 22:31:42 GMT. The current page could have changed in the meantime. CIHR‘s randomised controlled trial policy was announced in June 2004. This policy requires that all CIHR-funded randomised controlled trials (RCTs) be registered with an International Standard Randomised Controlled Trial Number (ISRCTN). The goal of the policy was to help ensure access to information about CIHR-funded RCTs. Since 2004, a number of developments related to trial registration and results disclosure have occurred, including the development of International Council of Medical Journal Editors (ICMJE) and Ottawa Group statements, World Health Organization (WHO) International standards, expansion of existing registries and creation of new ones, development of the WHO network of primary registries, development of Standard Protocol Items for Randomised Trials (SPIRIT) elaborations of Consolidated Standards of Reporting Trials (CONSORT), CIHR‘s Policy on Access to Research Outputs, a dialogue on results disclosure – Public Reporting of Clinical Trials Outcomes and Results (PROCTOR), etc. Currently prospective registration consists of submitting pre-defined controlled or uncontrolled trial protocol items to either one of the primary registries of the WHO or registry that is acceptable to the ICMJE prior to the recruitment of the first trial participant. The registry assigns an identification number (ID) and posts registered data on a freely accessible website. The assigned ID is meant to be used in all future communications including publications stemming from the given trial. Duplicate registration should be avoided. The objective of this Policy is to increase the transparency and accessibility of trials by improving their registration and disclosure of their results. Prospective public registration and disclosure of results are expected to help reduce publication bias, and fulfill ethical responsibilities to share knowledge gained from trials. It also complies with the WHO International standards, ICMJE requirements, and Declaration of Helsinki, thereby contributing to global initiatives to increase accountability of publicly funded health research. In accordance with CIHR‘s commitment to the highest scientific and ethical standards and core values the following principles guide CIHR in promoting openness and transparency of all trials through prospective registration and reporting of results. Trial participants, the general public, decision makers, clinicians, public and private funders and sponsors, have a right to access the full information about ongoing and completed trials. These principles are aligned with international standards for trial registration developed by the WHO and endorsed by ICMJE and with principles defined by the Ottawa Statement. This policy supersedes the 2004 policy on registration of randomized controlled trials (RCTs) and it will come into effect for all competitions with application deadlines after December 31, 2010. While Researchers awarded grants prior to this date are only obliged to adhere to the 2004 policy, they will be encouraged to adhere to the requirements of this policy. register all CIHR funded trials following the 2006 WHO international standards prior to the recruitment of the first study participant by providing at least the WHO Trial Registration Data Set, ethics approval (one per country, generally for the main site), a reference to the systematic review that justifies the need for proposed trial, and other trial details, to any WHO/ICMJE endorsed registry. register the trial in only one WHO primary registry or registry acceptable to ICMJE (such as ClinicalTrials.gov) following the WHO international standards for prospective trial registration. In instances when trial is registered in more than one registry, the grantee must provide cross-references to each registry including the identification number. provide CIHR with the name of registry and the identification number issued by the registry. This ID should be used in all further communication with CIHR, publications, presentations, and on the trial website if it exists. update trial information in the registry at least once a year, usually following annual ethics review and re-approval. report to CIHR and the registry major changes to the protocol such as the change of a primary or secondary outcome, or any other protocol amendment that requires ethics approval, upon approval by the ethics board, within 30 days. report to CIHR and the trial registry early stopping or termination of a trial, within 30 days. submit, for RCTs, the CONSORT -based final report to CIHR within 12 months after the end of the trial, its early stopping, or termination regardless of the reason. CIHR considers this report public and has the right to publicly disclose it within 18 months of its submission. The grantee must follow the most recent CONSORT that corresponds to a design of his/her trial. For all other trials, the grantee must follow CIHR reporting guidelines. comply with the CIHR Policy on Access to Research Outputs by publishing trial results in an open access journal or archive peer reviewed manuscripts in an open access repository (such as PubMed Central Canada). submit trial results to a publicly accessible results databank such as ClinicalTrials.gov by completing all required fields (tables) within 18 months after the end of the trial. post the aggregate (summary) data and micro (participant) level data on an unbiased freely accessible website. report any severe adverse event or harm in the publication of the trial results following the CONSORT for harms. submit any severe adverse event or harm to the trial registry along with the results if appropriate fields exist in the registry. retain all trial information including original micro-level data and metadata data for twenty five years unless they are deposited in a freely accessible data repository (to align with the Health Canada requirements). Grantees are reminded that by accepting CIHR funds they have accepted the terms and conditions of the grant or award as set out in the Agency’s policies and guidelines. In the event of alleged breach of CIHR funding policy, CIHR may take steps outlined in the Tri-Agency (CIHR, NSERC & SSHRC) Process for Addressing Allegations of Non-Compliance with Tri-Agency Policies to deal with the allegation. As the area of trial registration and results disclosure is constantly developing and as there are no international standards for results disclosure and no acceptable trial data bank, CIHR will review and update this policy every two years or as needed. Chan AW, Krleza-Jeric K, Schmid I, Altman DG. Outcome reporting bias in randomized trials funded by the Canadian Institutes of Health Research. CMAJ 2004 September 28;171(7):735-40. DeAngelis C, Drazen JM, Frizelle FA, Haud C, Hoey J, Horton R, et al. Clinical trial registration: a statement from the International Committee of Medical Journal Editors. N Engl J Med. 2004;351:1250-1. DeAngelis CD, Drazen JM, Frizelle FA, Haug C, Hoey J, Horton R, Kotzin S, Laine C, Marusic A, Overbeke AJ, Schroeder TV, Sox HC, Van Der Weyden MB. International Committee of Medical Journal Editors. Is this clinical trial fully registered? A statement from the International Committee of Medical Journal Editors. JAMA 2005;293(23):2927-9. Krleza-Jeric K, Chan AW, Dickersin K, Sim I, Grimshaw J, Gluud C. Principles for international registration of protocol information and results from human trials of health related interventions: Ottawa statement (part 1). BMJ 2005; 330: 956-958. Krleza-Jeric K, Lemmens T. 7th Revision of the Declaration of Helsinki: Good News for the Transparency of Clinical Trials. CMJ 2009; 50:105-10. doi:10:3325/cmj2009.50.105. Krleza-Jeric K: Building a Global Culture of Trial Registration, (pp 59-82); in: Foote MA (ed): Clinical Trial Registries; A Practical Guide for Sponsors and Researchers of Medicinal Products. Birkhauser, Verlag, Basel, Switzerland, 2006. Moher D, Bernstein A. Registering CIHR-funded randomized controlled trials: a global public good. CMAJ 2004; 171(7):750-75. Please direct enquiries about this policy to Dr. Karmela Krleza-Jeric, Senior Advisor, Knowledge Translation at karmela.krleza-jeric@cihr-irsc.gc.ca. CMAJ and openness: audacity or ignorance? I keep trying to figure out whether the CMAJ’s recent unofficial series of articles on various types of “open” is irony-aware or just pushing forward without realising what they’re doing. Brief background: the Canadian Medical Association Journal is THE major Canadian medical journal. They’ve been around for 100 years, and become rather prominent in the English-language medical publishing world, ranking quite well in various impact rankings. CMAJ was an early adopter of a free-to-read-online access model. 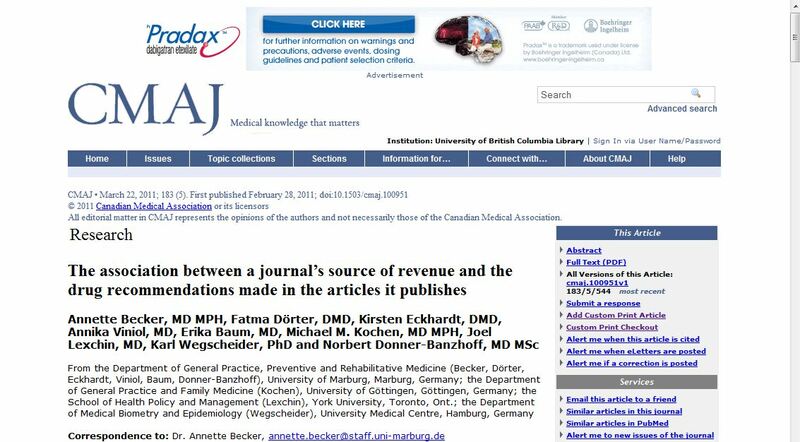 Then, in 2006 there was a kerfuffle over editorial independence, leading to mass firing/resignation of journal editors (who went on to found Open Medicine, which styles itself as more open and more ethical/transparent than CMAJ). In January 2010, CMAJ became “no longer free for all” by restricting immediate free access to a portion of the journal’s contents. The past week or so has seen a variety of CMAJ articles on open stuff: research, news items and commentary. I’ve been looking at some of these rather incredulously, unsure of whether the inherent irony and conflicts of interest here are editorially recognized or not. Yes, you read that right. An article about how a journals’ acceptance of drug ads correlated with biased drug information in said journals was spun as “free journals are junk” a year after CMAJ – which incidentally accepts a whole bunch of pharmaceutical advertising – stopped being entirely free online. With their recent access model shift, the CMAJ of all journals should understand that access models are not the same as business models, and that free access to medical journal content may be supported by several different revenue streams, including association membership fees, advertising revenue, grants, reprint/offprint charges, and publication fees to authors. Hmm, a drug ad on an article talking about drug funding for medical journals.…While I wouldn’t go so far as to imply that CMAJ is an industry-mouthpiece “fake journal” like some, this recent spin of “drug industry funded/biased” into “free to read” does make me wonder what’s up. Do they not realise that they’re incriminating themselves here? CMAJ has followed this conflation of free access with pharmaceutical sponsorship with a bunch of coverage of open data – a current semi-hot topic (rapidly being eclipsed by non-confidence votes in parliament) thanks to Steven Harper’s March 18 “Open Government” strategy announcement. First a news item alleged that “The systemic secrecy in which Health Canada shrouds data is “outdated” and “embarrassing” in comparison with the openness of other countries” , quoting co-author of the medical journal funding study Joel Lexchin as well as open government activist David Eaves. The next day, a news item lauded US President Obama’s Open Government Initiative. Just a few days later, CMAJ published an editorial titled “Will Open Government make Canada’s health agencies more transparent?”, which rightly criticizes the “black box” of Health Canada decision making, including the drug approval process. While I’m glad the CMAJ is championing some forms of openness including more open government information, CMAJ’s own editorial decisions/independence (latter link to PDF) , funding streams and potential pro-drug-industry bias are real elephants in the room here. Are the editors aware of this? What do you think? Boldly sidestepping the issue of one’s own conflict of interest, or not being forthright enough to acknowledge it?